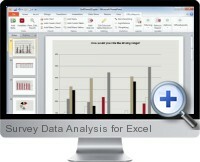 Survey Data Analysis for Excel (Office Reports) is a comprehensive solution for integrating survey data from various formats including Excel into Microsoft Office applications of analysis and presentation. Statistical data from SSPS, Triple-S or Excel data sources and formats can be imported and summarized with statistical analysis for reporting directly within Word and PowerPoint documents. Additional menus are provided within Word and PowerPoint to enable them as the survey data analysis applications in a simple and fast working environment. An interface allows viewing and managing imported survey variables for editing, adding , reorganizing and filtering. Tables and charts can be created and edited as Excel objects directly with the PowerPoint presentations and Word documents. Dynamic embedded reports and charts can be enhanced with filters, weightings, benchmarks and other analytical tools. Descriptive and summary statistics can be derived and displayed within the survey data analysis reports including data weighting through sample balancing, statistical confidence levels and benchmark comparisons. Layout and style of the survey data reports can be customized for tables, charts and analysis. Survey data analysis report structures and styles can be saved to reuse with updated data or create multiple reports for departments, business units, products or any other breakdown. Multiple reports can be generated automatically from unique values within data filters in PowerPoint, Word or PDF.